Just what is a cliché and what is it doing to our photography? My name is Sean Goswell, 39. I am an amateur photographer based in Oxfordshire. Living close to so many woods, Its only natural that I have a strong love for photographing them throughout the seasons. My work is slowly becoming more project based as I feel my images work best when seen together. The best part of social media is not the ability to promote ourselves, but the window that it can allow us on to the world as seen by others. 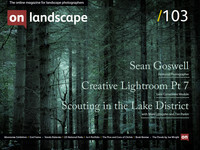 I forget now exactly where I first came across Sean’s images but his images of woodland have kept popping up in my feed. This year I’ve had the sense that he has been finding his feet – they have become more carefully considered compositions, often muted in colour, a window of soft light into a treed land. They are full of texture, and remind me of places half-remembered from folk tale engravings. Can you tell me a little about your education and interests, early exposure to photography or the arts, and career/vocation? You’ve spent some time working abroad? I was brought up and educated in Oxfordshire in a small rural village. School was never really my thing; I wasn’t particularly academic but found a passion for storytelling and drawing. I made a decision early on that I wanted to be an illustrator and go to art college. I always remember having a conversation with my art teacher, who in his wisdom told me that it was a tough business and I would never make any money and strongly advised me to do something else!! !.